It all revolves around hydraulic fracturing. Here's the part that most people don't seem to realize: Without fracking, the entire North American oil and gas industry would come to a screaming, painful halt. This is the reality we all need to face, regardless of protesters who abhor the fracturing process. Hydraulic fracturing is a simple process, really. It's used to create fractures in a rock formation by injecting the rock with a mixture of water, proppant (think: sand), and chemicals. Once opened, the fissures allow the oil and gas resources to flow more freely into the well, which can then be extracted through the well bore. Here's a video of this procedure in action. Although fracturing technology has roots that date back to the Civil War, the first case of hydraulic fracturing actually took place in 1947 when a company by the name of Stanolind Oil Company used it on a well in Kansas. In 1949, another company came along and began using their patented HydraFrac Process. You might have heard of the company before... It goes by the name of Halliburton. 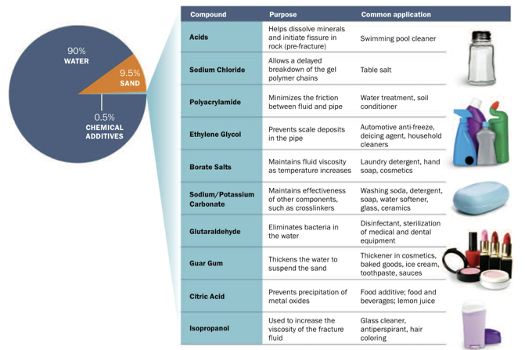 The controversy surrounding the technique and its impact on the environment didn't reach a feverish pitch until a few years ago. It all comes down to water. To be more specific, it all comes down to the fluid that is flushed down the well during the process... millions of gallons of frac fluid. Since the composition of this frac fluid is the issue, it's good to know 99.5% of it is water and sand. And here we come to the point of no return for most anti-frackers: water contamination — that is, the threat of this frac fluid reaching someone's water source. Note: No matter how many times they argue it, there's never been a case of frac fluid migrating up to the water table. In a typical well, the rock formation being fractured lies at a depth of more than 7,500 feet. 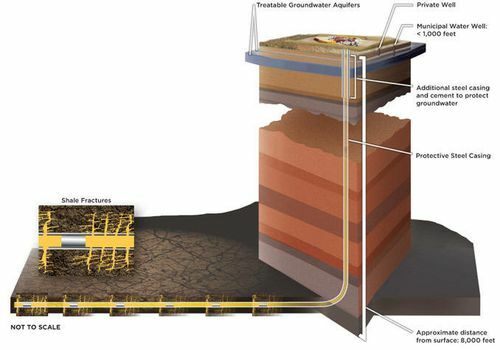 Water aquifers are usually found at a depth of 1,000 feet. Between the two is a mass of solid rock. Another thing fracking has changed? It's gotten the U.S. out of OPEC's chokehold. The U.S. isn't the only one making use of fracking technology. The U.K., where fracking has been a controversial topic, has just allowed a local company to drill a set of wells for the first time since the company created a small earth tremor after drilling in 2011. This will set the path for other companies to use fracking technology in the U.K., possibly creating a similar shale boom to the U.S.
Of course, there's a direct way to invest in hydraulic fracturing. As you know, companies like Halliburton have been around for a long time. Believe it or not, there are companies out there whose sole objective is to mine sand and other materials to sell to companies that perform the frac jobs. One company, CARBO Ceramics (NYSE: CRR), manufactures ceramic proppant to use in place of sand. And the results speak for themselves, as drillers are able to increase production and EURs (the quantity oil and gas believed to be ultimately recoverable in a reserve or well) due to the uniformity of the ceramic proppants compared to sand. If you know where to look, you will find other potential powerhouse stocks that will be making gains no matter how low oil or natural gas prices fall. These smaller plays are the real cash cows in the energy boom. Wall Street will be buying hand over fist once these relatively unknown stocks reach their radar.